William Hogarth - The Sleeping Congregation. William Hogarth - Industry and Idleness. William Hogarth - William Hogarth (1697-1764) Hudibras and the Lawyer/Hudibras beats Sidrophel. An Election Entertainment is an original etching realized by William Hogarth in 1755. The etching was engraved also by Francois Morellon de la Cave. Original title: An Election Entertainment, Plate I: Four Prints of an Election. Signature on plate: "Painted and the Whole Engraved by Wm. Hogarth. / Published 24th Febry. 1755, as the Act directs". Inscription on plate: "To the Right Honourable Henry Fox, &c. &c. &c. This plate is humbly Inscrib'd by his most Obedient Humble Servt. Wm. Hogarth". Includes passepartout and frame (62 x 2 x 74 cm). Good conditions, except for a browning of paper due to the signs of aging. The print is from the series The Humours of an Election (1754-58), the artist's last painted cycle regarding contemporary affairs. The paintings are now in Sir John Soane's Museum, London. 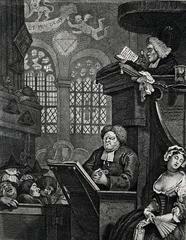 Unlike the other three engravings in the series, An Election Entertainment does not reverse the original painting, as in the case of when Hogarth made engravings from his own works. Rather, it replicates the composition of the painting. The scene, deliberately parodying the composition of the Last Supper, takes place at an election banquet organized by the Whig party in an attempt to wine and dine their way to victory. This artwork is shipped from Italy. Under existing legislation, any artwork in Italy created over 70 years ago by an artist who has died requires a licence for export regardless of the work’s market price. The shipping may require additional handling days to require the licence according to the final destination of the artwork.